On Day Two, FO Week is kicking into high gear!!! You ladies have been have been working hard. First up, Chris has finished Kiri!!! If you remember how she struggled with Kiri on her first go 'round, you'll know what a sweet victory this was for her. Chris has the upper hand this time - a beautiful shawl that only took one skein of Knit Picks yarn and gets credit in THREE KALs!! And knit in only TEN DAYS??? Go Chris. Up next is Amanda. On Friday she had one sock, but as of yesterday she has a FO!!! Check out her great socks knit AND crocheted with Rumba (one of my favorite ballroom dances, by the way!!) Don't they look so cozy?? 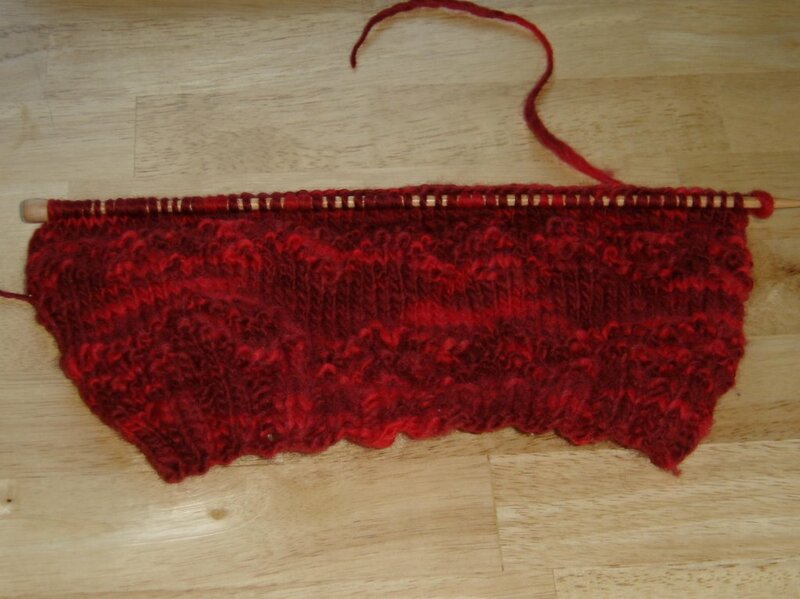 And again, knit with just one ball of yarn from Knit Picks. Way to stretch that yarn budget, girls!! Jenn finished the cutest little baby dress knit with Lion Brand Cotton Ease. (Washability is a must for the little ones). It's so precious, and be sure to scroll down for a close up of the buttons!! She finished this just in the nick of time, as the little girl was born over the weekend. Welcome to the world. Chrissy finished her Master Level 1 swatches!! Scroll down the to middle of her post and take a look at them all. Patterns, stripes and cables galore. How impressive are those?? Great job . . your on your way to becoming a Master Knitter!!! I have a FO today as well. 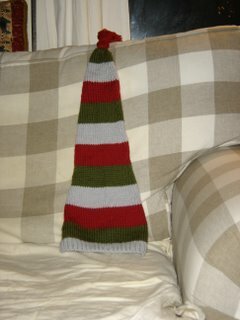 Pea's Christmas scarf is finally all blocked and ready for him to wear! Poor guy, he unwrapped it on Christmas, and then I promptly took it back telling him it needed to be blocked. It sat in my craft room for a month. Sorry, Sweetpea!! It's all done now and I'm very pleased with how it came out. 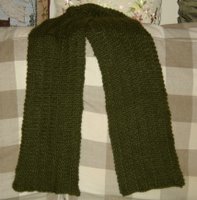 The yarn was a joy to work with and the pattern was so simple. I could have knit it much faster, except I had to hide it from him!!! It's been a chilly and rainy day here, the kind of day that makes you want to curl up on the couch with a cup of tea and some knitting. I'm working hard on my Felted Gift bag, which can be filled with something special for Valentine's Day. I'm also in the home stretch on Airy Scarf. With any luck, maybe I can get Tie One On finished this week too?? Can't wait to see what you guys are finishing up this week too! We begin FO week with two WIP's that were completed over the weekend. 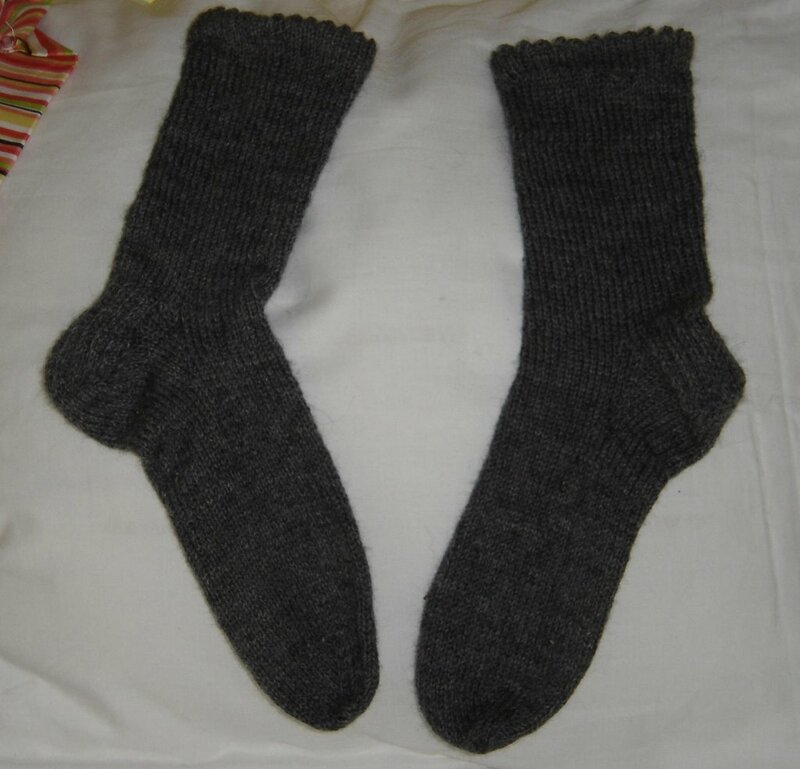 First up is a beautiful pair of socks by Stephanie. Go look . . . can you believe this is her FIRST EVER PAIR???? 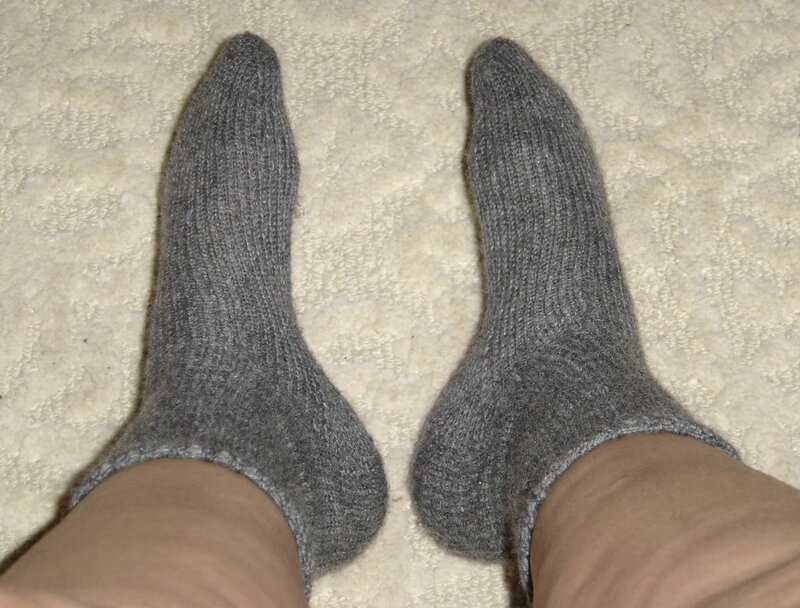 As a new sock knitter myself, I appreciate the sock tips she's shared. And I think my next book purchase will have to be Sensational Knitted Socks!!!! Best of all, these socks also get her credit in the 2000 Socks KAL. Yea for multi-tasking!!! I have a FO today too, the slippers I started last weekend in Vermont. I'm glad I decided to spice the second one up a bit by doing a provisional cast-on and practicing my Kitchener Stitch on the back seam. It worked beautifully and looks much better than the sewn one. I think the three-needle bind-off may have worked too, but I actually like doing Kitchener! 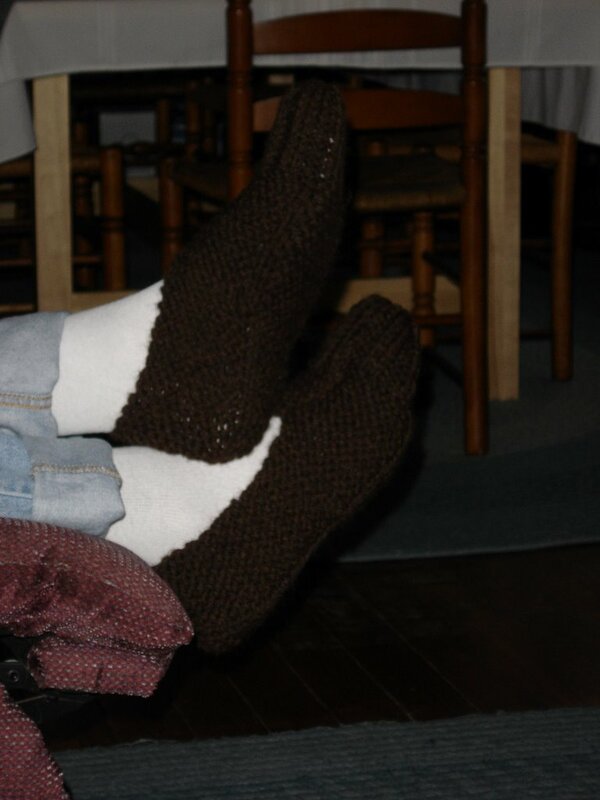 These are like the brown slippers I made for my brother for Christmas, just not as big!!! If you haven't joined FO Week yet, it's not too late! Finish off your lingering projects and strut your stuff!! I'm also thinking of doing some prizes, just to make it even more fun (who doesn't like prizes??). Everyone who enters will have a chance at a prize, and for each FO you post this week you'll get another chance. So come on, sign up!! Thanks to everyone who sent me healing wishes over the weekend. I'm still a bit stuffy, but feeling much better. I talked to my friends, and they all gathered at someone else's house to hang out, so I was glad to hear I didn't spoil everyone's evening. Just in time to cheer me up and make me feel better, look what arrived in the mail!! A sweet surprise from Lynne, who I was spoiling during Secret Pal 6. Aren't those the cutest socks you've ever seen? The little lambie heads on the back are so cute . . . they even have gooley eyes!!! I am loving the Knit Simple magazine, there are several projects I'm considering trying (including a really pretty sweater). Thank you so much Lynne, you are so sweet! Okay, I'm off to work on my next WIP, with high hopes of flashing another FO tomorrow. 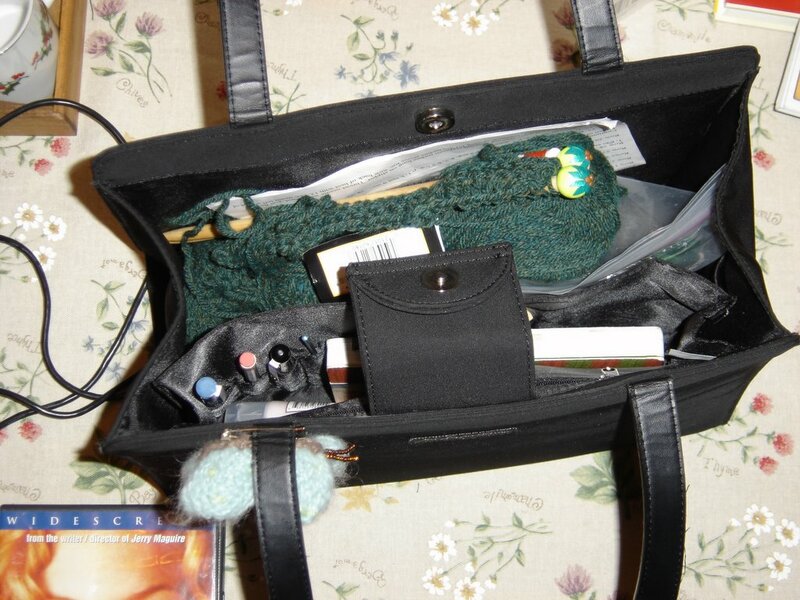 There are still a lot of projects in my knitting basket that I've been wanting to finish up. They've dragged on too long. So I started thinking about proclaiming this week to be FO week. Get them all done, and post them in each blog entry. Want to play too? Sure you do!! Think of all your New Years Intentions about finishing up your WIPs. Got a sweater that's been waiting to be seamed? 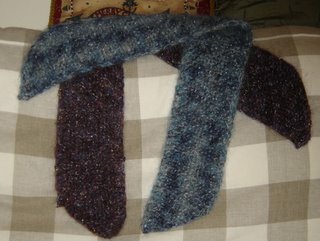 A scarf that needs blocking? A sock that's thisclose to being done? A hat that's been lingering on the needles? Now is the perfect time to . . . Simply leave me a comment if you think it sounds like fun!! Then send me an e-mail each time you post a FO, and I'll link it to my post that day! FO Week will begin tomorrow, January 30th and end on Sunday, February 5th. Any project you've finished this weekend can count as your first FO tomorrow!! Come on, let's clear out those WIP's!!!! All the planning. All the prep work. All the cleaning (okay, I would have done all the cleaning anyway). All for nothing. The most sure-fire way to kill a dinner party before it even starts . . . .
have the hostess come down with a cold the day before!!!!! It's my own fault. I went shopping with my friend Barb on Thursday and was stupid enough to say "I'm probably jinxing myself, but Pea and I have both made it through the winter so far without any bad colds". When ever you start to utter a sentence that begins with the words "I'm probably jinxing myself . . . " DO NOT FINISH IT!!! Bite your tongue. Duct tape your mouth. Do whatever it takes!!!!!! I actually do feel better today than I did yesterday, but not well enough to host a big party. Not to mention, touch food that other people will eat. People with small children who catch every germ anyway. And one person who is pregnant. That would not be good. So Pea called them all, and we'll start looking to reschedule. I now have plenty of time to knit - but it's a very disappointing way to earn some knitting time. And what will I do with all those meatballs I made (pre-cold, of course)? I'm one of the very few Italian people I know who hates meatballs. Maybe it's because I'm only half Italian?? (But my Italian grandmother told me she didn't really like them either, so I'm in good company) Will trade MEATBALLS for YARN!!!! PMS??? Just plain blah? I don't know - but I've been feeling out of sorts all week. I'm hoping it will pass soon. But, what could be more cheering when you're feeling blue than NEW YARN??? First of all, my super prize arrived from Kathy!!! Isn't it just wonderful. I already know the buttons will go on a sweater for Bestus Buddy's new baby - who will be arriving in March. (I'd better get those needles working!!!) I'm not sure what I want to do with the yarn yet, but I will find something very special for it! Speaking of doing something very special, I've also been on the look-out for something wonderful to do with the DB SoHo yarn my secret pal sent me a while back. I thought maybe I could use it for legwarmers for the Cover Your Legs KAL I have yet to contribute to. I'm attempting to write my own pattern, which seemed to go pretty well. The yarn is a joy to work with, but not for this project. There was a bit of weird pooling, which didn't bother me much, but I felt that the stitch definition got lost. Also, I didn't think I had enough yarn for both legwarmers, so this got frogged. 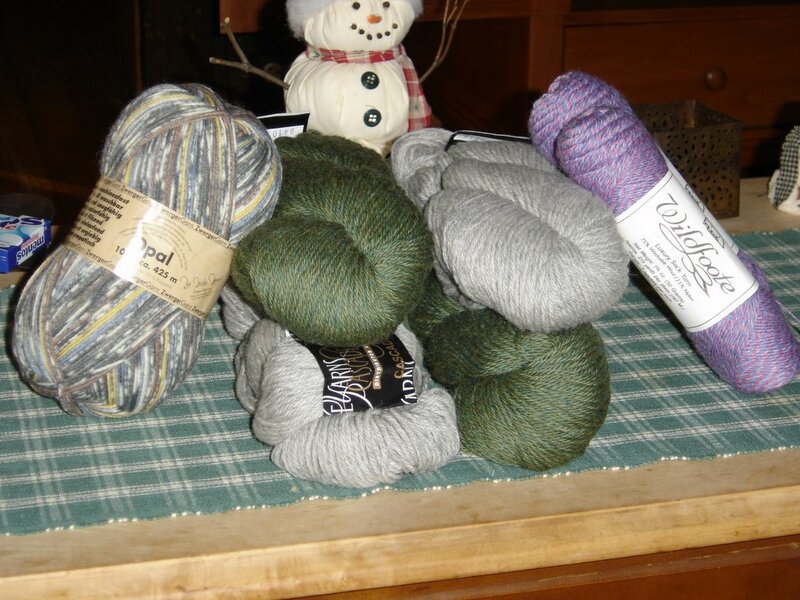 I'm going to start again with some Wool-Ease from my stash. Before you think I forgot, here is the picture of the yarn I bought last weekend! See how happy the new yarn made Mr. Snowman?? (I made him a few years back, when I did more sewing.) I can't wait to try out the sock yarns. As for the Cascade 220 - I can't wait to try that out either, but I'm having second thoughts about the Brioche hat and scarf. I took a look at the pattern, and it looks SO HARD!!!! We'll see - maybe after I try the Olympic socks. I've been feeling like I'm working on a ton of different projects and not getting any of them done, so I think I'll concentrate on finishing some of them up now. The slippers are almost done - I made them more challenging by doing a provisional cast-on so I can practice my Kitchener grafting on the back seam instead of just sewing it up. I also am trying to learn Continental knitting - since this is mostly a garter stitch project it seemed a good way to make it challenging. The Thuja socks are coming along - I'm having fun with the pattern and loving the Trekking XXL yarn, so I find I just want to knit them and leave everything else in the knitting bag. 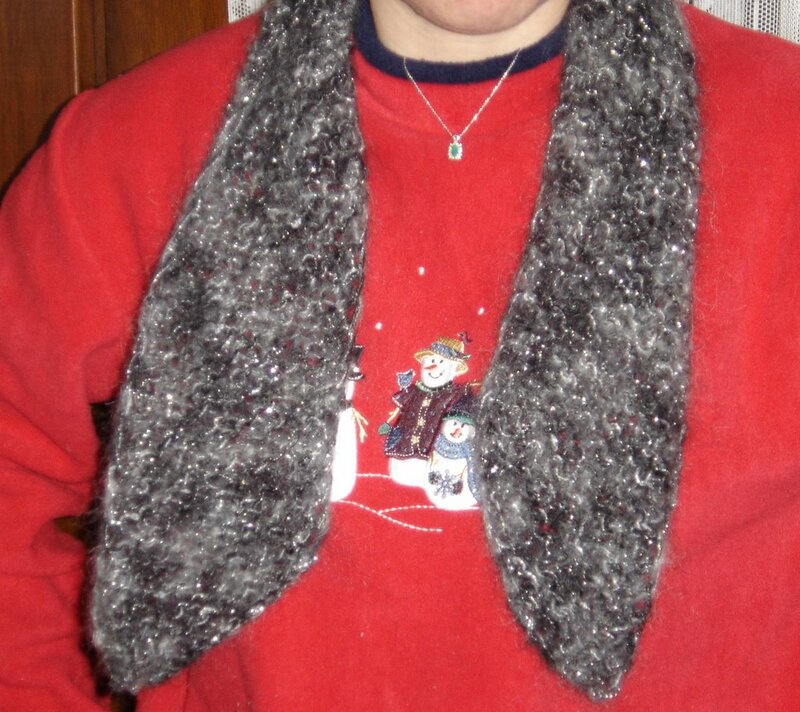 But I also want to (finally) get Airy Scarf finished too. Heck, it's supposed to be a FOUR HOUR KNIT!!!! Did I mention I'm hosting a movie night get together we do every few months with a group of friends? I actually started it, two years ago, when I did a Godfather & Make Your Own Calzone night. Since then, it's been a tradition. Well, this month EVERYONE is free - so I'm doing dinner for eleven!!! It will be a blast, but will seriously cut in to my weekend knitting time!! So enough rambling for now . . . I'm off to do some knitting and plan my dinner. Sweetpea and I went on a nice trip to Vermont this weekend - which is why I haven't been posting or commenting since Friday. I wondered if taking the weekends off from my computer addiction might be a good idea. Then I got home to find 91 UNREAD POSTS on Bloglines!!!! It will take me days to catch up. Please forgive me for not commenting until I get through them all - but I will read each and every one! Anyway, our stay was courtesy of a late wedding present from a friend who missed our wedding and then fell off the face of the earth for 10 months. When he finally resurfaced, I guess he felt he had a lot to make up for . . . although I cared most about the friendship and was really not at all worried about a wedding gift. We did enjoy a lovely trip though. We stayed in Killington at The Vermont Inn. It was just as quaint and lovely as it looks on the web-site. I liked that there was no TV in the room, because we tend to fall into the bad habit of clicking it on first thing. We did, however, have a fireplace which was so romantic! The views from every window were gorgeous - and yes, I did bring my camera. I'm always really good at remembering to pack the camera. The part I never remember though, is to unpack the camera and take pictures. Waaaa. Pea was looking forward to some nice, long, snowy nature walks. That's not really my thing, but I was game since he loves it so . . . okay, and also because he promised to take me shopping after!!! Not only was there NO SNOW (when has there ever been no snow in Vermont in January???? ), but it rained most of the day Saturday, with gusty winds. Not good for nature walks. But very good for shopping!!! We headed over to Rutland and started out at Mr. Twitters. It was really cute, but also kind of expensive. It was a wonderful place to poke around though, and they had free coffee and snack samples - Key Lime Tarts!!! Yum. 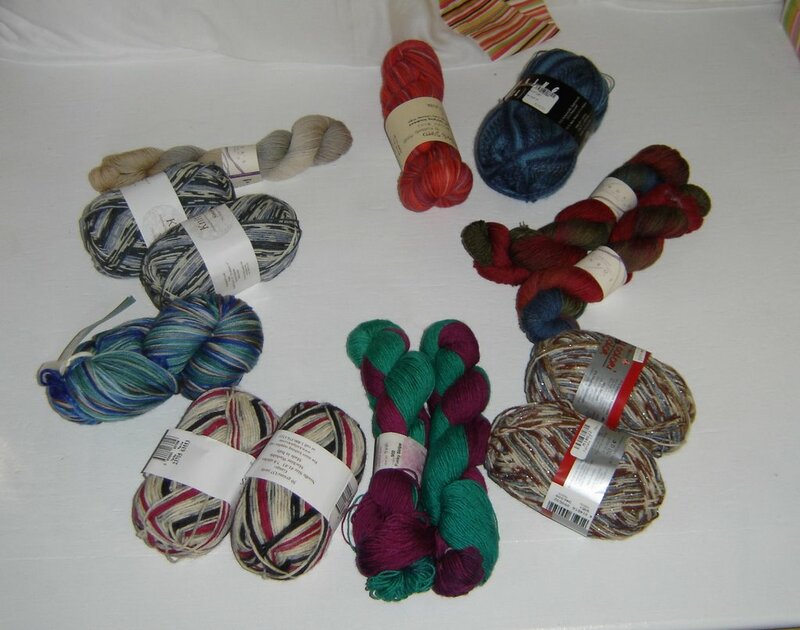 We then headed further into Rutland and found Lamb's Yarn Shop (scroll down a bit for the shop's review). Since it's part of someone's house, we drove by three times before we found it (but how cool would it be to have a YARN STORE IN YOUR HOUSE!!!!). As we walked to the door, I was unbelievably excited to see a sign that read "All Yarn 20% Off". 20% OFF???? ALL YARN???? Seemed too good to be true. Well, every silver cloud has a dark lining. (Isn't that how the saying goes??) I walked through the door and was greeted my "Mrs. Lamb's" friendly daughter. She reminded me that all yarn was 20% off (ha, like I would have forgotten). Then she explained that the reason all the yarn was marked down was because the store was closing. It had gotten to be too much work for her mother, who was a very cute, very small, very old lady who needed a walker to get around. It's sad, because just by listening to "Mrs. Lamb" answering questions for the other customers, it was so evident that she loves yarn and is an expert in the craft. I tried not to be too sad, she seemed to have had a good run with the yarn shop, and I'm hoping she's happy to close that door of her life and have more time to knit her own things, bake some more (she had a blueberry pie in the oven when we were there) and relax. Even though they were clearing out their inventory, they had a great selection of yarn. I immediately picked out a skein of Opal sock yarn, because I read on a comment to Chrissy's Socks Galore post that someone recommended it as their all-time favorite sock yarn. I guess I didn't notice the comment where someone said they didn't like Wildefoot, because I bought some of that too. 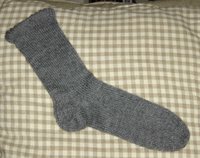 They had a sample sock knit up in it, and I liked the thickness of it. Hopefully I won't find it bad to knit with. I also bought four skeins of Cascade 220 (which I've seen being knit up all over blogland) to make the Brioche Scarf and Hat from Weekend Knitting. I wanted to post pictures of my yarn haul, but it's been too dark and stormy today to get any good pictures. Maybe tomorrow? On Sunday we headed home, which involved passing right by the New Hampshire exit where my best friend lives!!! So we were able to stop in and spend a few hours with her, her husband and my godson!! She is counting down the days until the new wee one is born, just two more months! I better get my little knitting needles flying!! So, not much knitting got done, aside from working on another pair of slippers on the car ride home. Yes, I am sick to death of knitting slippers, but my thick warm pair has HUGE HOLES worn in the bottom and I am in dire need of a new pair. 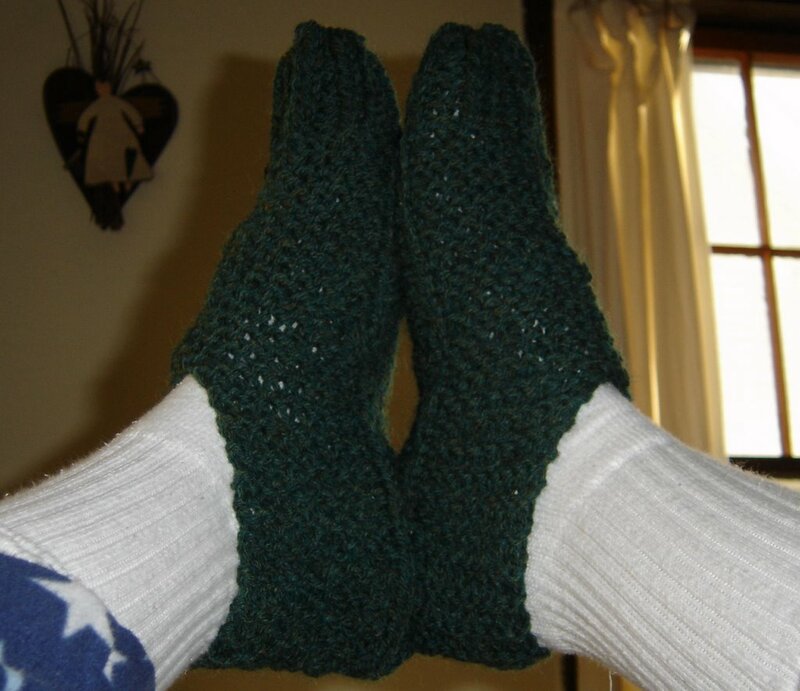 (It's still too cold to wear the worsted pair - New England winters need bulky!!!) Knitting for necessity, not for fun - I guess that's how my grandmother started. Before I go, I just wanted to thank you all for your supportive comments on my Olympic Challenge!!! You are all much more confident in me than you should be - but I'm really just in it for the fun. I don't imagine I will master those socks in 16 days, but I'll enjoy having the challenge to work on - in between Figure Skating broadcasts, of course!!! Then I caught wind of this. And I started thinking, how challenging would it be to tackle this???? I could learn all three techniques at once!!! And in only 16 days!!!!!! Yes, I do fear I have gone stark raving mad. Yes, I'm sure I will live to regret the day I decided this would be a great Knitting Olympics challenge. Yes, I am going to give it a whirl anyway. Yarn is all wound and ready to go. Needles have been purchases. Pattern has been printed. And yes, I may not end up with a gold metal, but at least I'll have tried and I know I'll learn something in the process. Even if it's just "Never attempt to learn three new things at once"!! 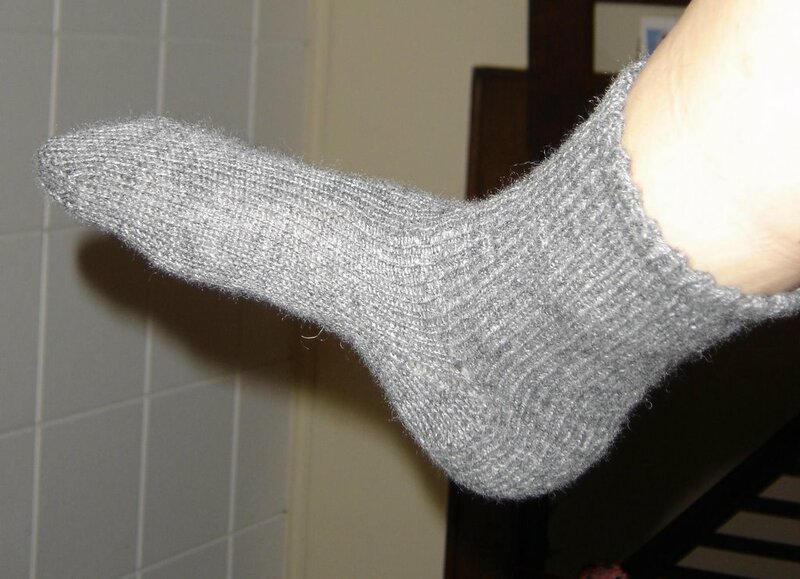 So, are you ready to see the world's most slowly knitted pair of socks??? So, my thoughts on knitting my first pair? First of all, I am painfully slow at knitting socks. 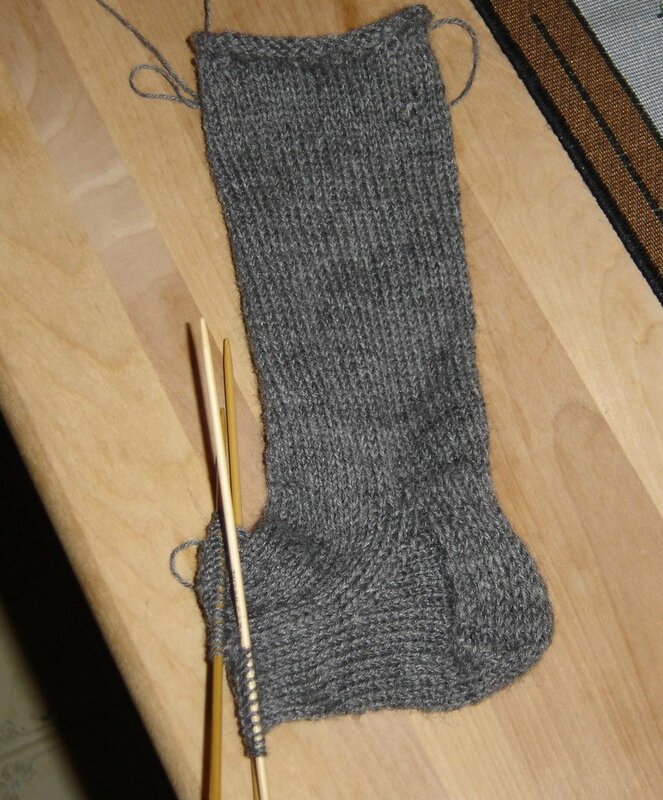 The first sock was cast on in mid-October and finished on January 6th. (Yes, these are Socktoberfest Socks!!!) The second one, however, was downright speedy in comparison. It was cast on January 6th and completed on January 18th!!! I really stalled on the foot . . . the last three inches seemed to drag on forever!!! However, I did pass the worst part on the learning curve some time during sock one, because the second one seemed so much easier. I even lost my hatred for DPN's!! I have to admit, I didn't love the pattern. In my usual sloppy fashion, I just dug into my folder of patterns, found this one, and started knitting without doing much research. I did the picot-edged woman's sock, but omitted the garter checker pattern because I wanted to try something really basic. I would recommend stitching the picot hem with elastic instead of yarn, because it's REALLY HARD to get on and off my foot. Yes, I did follow the instructions and stitch the hem loosely, but it doesn't seem to help much. The yarn is Knit Picks Essential in Ash. Again, I wanted a really plain, basic sock that I could wear with anything. I do like this yarn, although I don't have any other sock yarn experiences to compare it with yet. However, it knits up nicely and the price is great!!! A big thank you goes out to Christine for the wonderful Kitchener Stitch tutorial. I've heard many a horror story about Kitchener Stitch, but thanks to this handy dandy guide, I had no problems. I even managed to do the second toe while watching LOST last night - ignoring everyone's advice to lock yourself in a silent room!! Another huge help was this wonderful tutorial. Any time the Lion Brand pattern left me a bit confused, I could pull up the tutorial and get back on track. 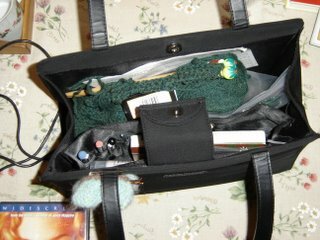 I think the major problem was that I decided to knit them on three DPN's even though the pattern is written using four. I know, sometimes rational thought just leaves my head!! And again, a huge thanks to all of you for all the supportive comments you left, cheering my on when things got tough!! Yesterday, I did the post-holiday organize and sort of my craft room. (I'll have to post pictures of my craft room soon, it's one of my favorite places!!!) 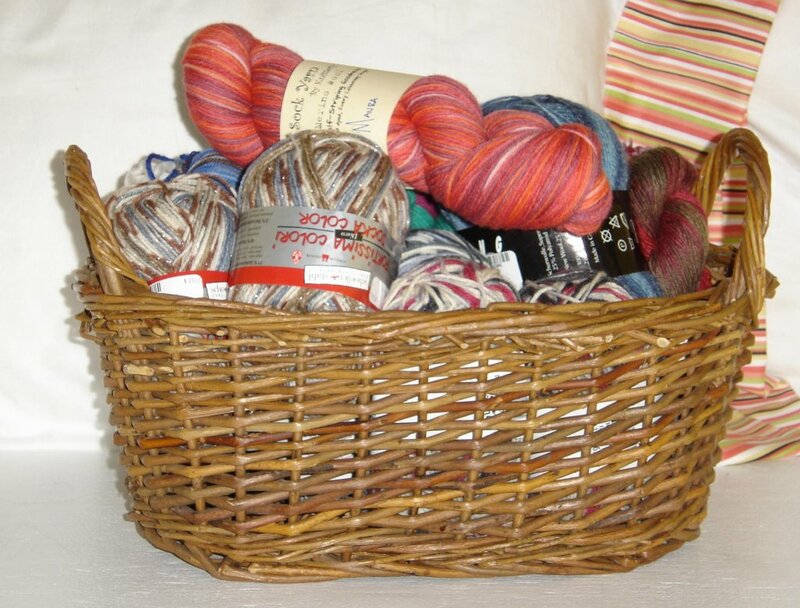 I decided to sort my yarn by type and arranged them in baskets. I seem to have amassed quite a large basket of sock yarn!!! Here they are in all their bright, soft, yarn glory!!! Clockwise from the top right, we have Trekking XXL 104, Lorna's Laces Tuscany, Schoeller Stahl Socka Disco Color 9051, Lorna's Laces Funky Stripe (from my Secret Santa), Knit Picks Parade Checkers, No No Kitty Great Outdoors, Knit Picks Simple Stripes Storm, Lorna's Laces Aslan, AND at high noon (or maybe midnight) Vesper Maura. I am so out of control!!!!! I feel somewhat lost without a pair of socks to knit, so next up I plan to use the Trekking for this pattern by Bobby. (And yes, I did snap up two pairs of his Addi's!!!!) 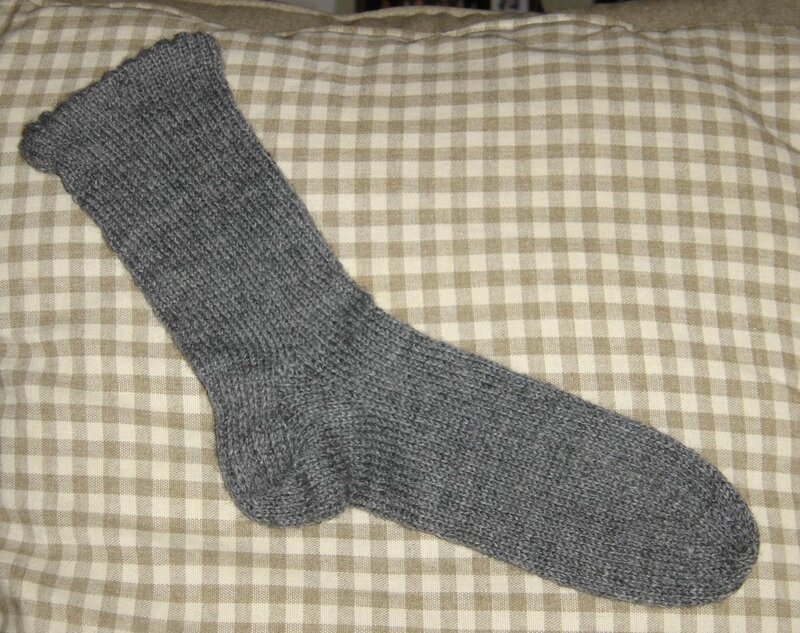 I'm also considering joining the Knitting Olympics with a huge sock challenge. Am I crazy enough to try it??? There will be no more posting until my Sockling Socks are finished - complete with a FO picture for you. In the words of my most favorite heroine . . .
"As God is my witness, as God is my witness they're not going to lick me. I'm going to live through this and when it's all over, I'll never be sockless again. No, nor any of my folk. If I have to lie, steal, cheat or kill. As God is my witness, I'll never be sockless again. " Kathy had a contest which involved identifying the title of a song by some lyrics. Well, it seems my freakish ability to remember song lyrics has finally come in handy! I won, I won. Maybe Friday the 13th isn't such a bad day for me!! I never meant to be a Goody Two Shoes, but somehow I always have been. Followed the rules. Never got detention. Never got searched by security when going into concerts. They would pat everyone down, but when I got to the head of the line, they would just say "You're okay, go ahead". I could have had ANYTHING hidden in my '80's oversized sweater! I never did though. I guess they could just tell. Heck, I'm convinced I'm the only person in the world who graduated college never having, uh, tried a puff of a certain recreational product. I guess my subconscious must feel like it's missed out on something. I found myself totally intrigued and obsessed with a certain yarn. I hope the neighbors weren't around yesterday, when I danced with joy on my front porch because a little brown box arrived containing this!! I hadn't even opened the box yet, and I was already feeling a contact high!! I picked it out to knit this little cutie. I'm dying to start it RIGHT AWAY, but I'm trying to hold out and finish my Socktoberfest socks first (yes, I am aware it is January!!). And I should probably knit my legwarmers and Hourglass soon, so I can actually wear them before it gets warm. It is this "responsible nature" that prevents me from losing my Good Two Shoes status. But after those projects are finished, watch out!! Rebel knitter!!! Hemp here I come. Kind of gives a whole new meaning to the words "STASH YARN". So, here in all their LARGE glory, I present to you, The Jolly Green Giants. These started out as slippers for my 6'2" brother for Christmas. 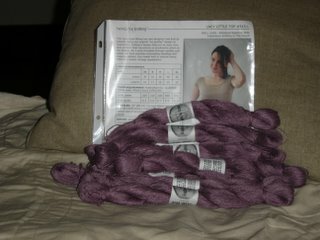 I inadvertently bought worsted yarn instead of chunky, and they are quite thin, but I'll wear them in the spring. After I knit the first one and decided it wouldn't be warm enough, I put them aside until last week. I used this pattern, which is supposed to be one size fits all, but they are very big on me. Next time I will eliminate a few rows (or maybe try the pattern featured today on my Knitting Pattern A Day calendar). 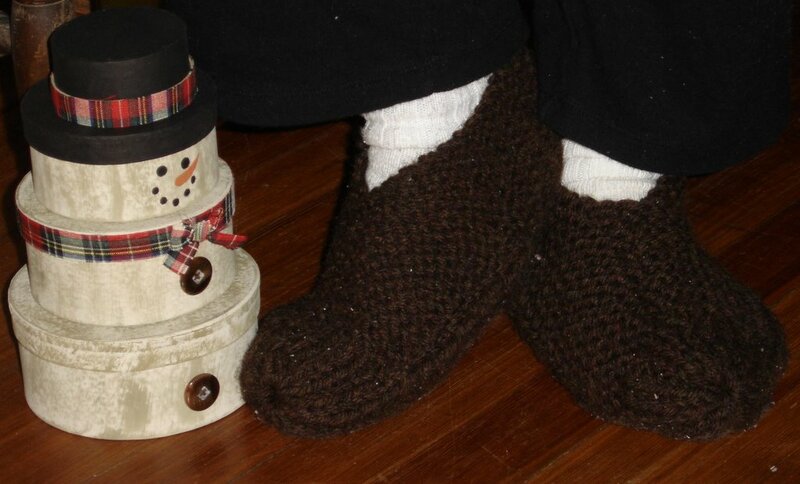 My real goal was to make slippers like my Grandmother used to knit for us. I think this pattern is pretty close. Here is the last pair she made me (they have holes in the bottom, but I still can't throw them out), next to the Green Giants. I always though she used variegated yarn, but upon close inspection I can see she knitted them with two strands held together. See, I am actually learning something - a few months ago I don't think I would have realized that!!! I like to think she would be proud. On a completely unrelated subject (which also has nothing to do with knitting), here is what Pea brought home from work yesterday!! Not our anniversary . . . not my birthday . . . . he just loves me! 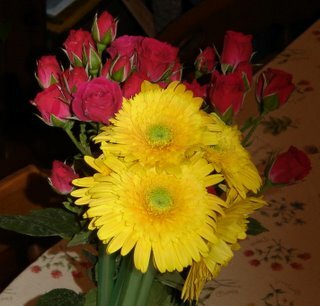 And he knows Gerbera Daisies are my favorite. Isn't he sweet? If you read this, if your eyes are passing over this right now, even if we don't speak often, please post a comment with a COMPLETELY MADE UP AND FICTIONAL MEMORY OF YOU AND ME. It can be anything you want--good or bad--BUT IT HAS TO BE FAKE. When you're finished, post this on your blog and be surprised (or mortified) about what people DON'T ACTUALLY remember about you. So come on, what's your favorite "memory" about the two of us?? Has anyone else who uses Blogger noticed that the comments people are leaving are no longer being e-mailed to them? I've noticed it since Friday, but don't know if it's just my blog or Blogger-wide. Thanks!! Today's post is brought to you by the letter . . .
F is for my First try at socks. F is for Finished (better know as F.
F is for Fits . . . and it actually does!!! As in Saturday, and also Sockling Part II, which I'm off to cast on now. Wouldn't want tomorrow to bring Second Sock Syndrome!! I'm very excited to be able to introduce you to the Secret Pal who was spoiling me: Peanut!!! She was the best secret pal I could ever have wished for. She was fun to e-mail back and forth with, and I look forward to continuing our friendship and inspiring each other to tackle new knitting projects. Each package she sent was filled with such generous and thoughtful gifties, I felt so truly spoiled. Thank you, Peanut, for making my first Secret Pal foray so much fun. Tomorrow is the official end to my holiday season, as Pea's vacation is over and he's back to work. Which means I'm back to cleaning, sorting and de-cluttering the house, and figuring out what I want to be "when I grow up". We've had so much fun watching movies together over the past couple of days, I'll really miss him tomorrow when he's at work. But I think we'll try to have movie days more often - especially through out the winter when it's so nice to stay home - warm and cozy!! In an attempt to start the year off on the right foot, I am going to post ALL the pictures I've been promising for the last two weeks!! My apologies if this entry takes forever to load on your computer. I'd like to start with some of the great gifts sent by my Secret Santa!! 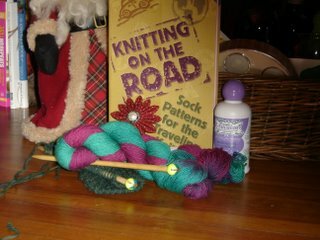 I can't wait to master socks and tackle some patterns in Knitting on the Road! And isn't the Lorna's Laces just gorgeous?? It will certainly make the prettiest pair. Can you make out the Palm Tree Knitting Needles - they've already got a WIP on them. These needles are great - the wood is so smooth and silky and the points are super sharp. They are a joy to knit with. 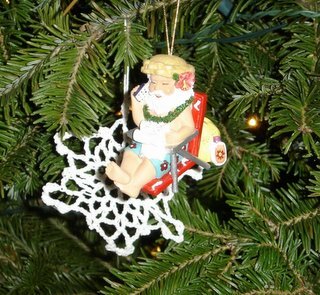 And take a look at the cute ornament she sent for my tree. I love putting ornaments on the tree that remind me of a special time - and this one will bring happy memories of my Secret Santa and all the wonderful friendships I have formed this year. 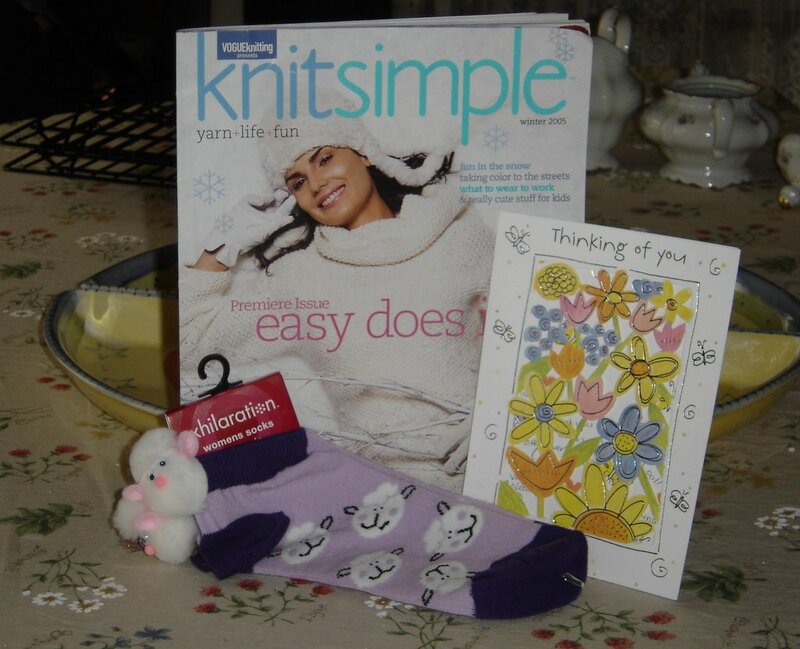 Next up are some of the other knitting gifts I blogged about in my last post. 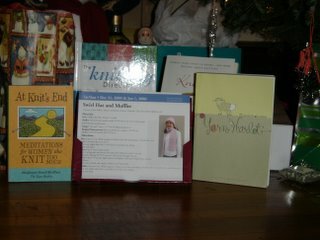 The two Harlot books are from Pea, the calendar is from my parents, and the Knitting Dictionary and Knit Lit (Too) is from my Bestus Buddy. 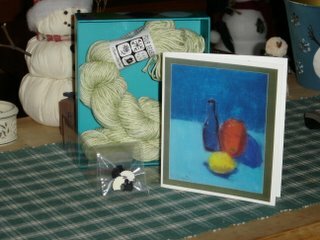 The spindle box is peeking out next to the Yarn Harlot book on the right!! And . . . drumroll please . 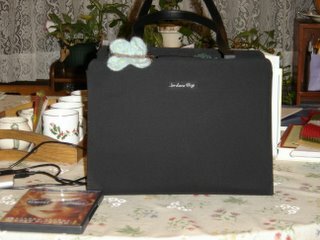 . . the knitting bag!!! And now for some FO's. Here are both completed "ghetto scarves" that I knit for my cousin's daughters. I also finished one for myself this afternoon. And the BIG slippers for my size 12 foot brother . . . all done and fit perfectly on his feet! 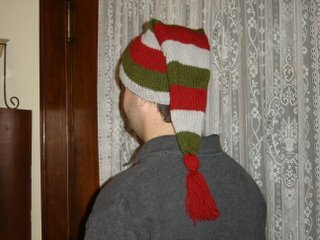 And the crazy hat my friend Dave requested. Here it is!! It's based on this pattern, but I modified it to knit in the round. For the full effect, you have to see it on. So Pea was happy to model for me!! So, did everyone have a wonderful New Year's Day? Pete and I started the morning with the yummy French Toast Bake recipe from Cathy. I will be making this time and time again - you do all the prep work the day before, and in the morning just pop it in the oven to bake. I cut the recipe down to serve two of us, and used Pepperidge Farms Cinnamon Swirl bread - so yummy!!! Then Pea and I watched Mystic River, which has been out for a while but I hadn't seen it. It was a bit more violent than I like, but had a great story. We then went to my parents for lasagna, and came back home for another movie. This time it was Almost Famous, which I'd been wanted to watch again. A relaxing day of movies and knitting is my perfect idea of how to start the year off. I was even inspired to work on my Sockling Sock - which hadn't been touched since I messed up the gusset in November. With the help of the tutorial, my second attempt at the heel turn and gusset seems to have worked. I think I'm back on track with it and hope to finish it up in the next couple of days. I hope you all had a safe New Year's Eve, a fun New Year's Day, and a wonderful year filled with love and happiness ahead!